The August meeting was very social with discussions about our own unique systems, what we’ve put together or bought and plans for the future. I for one would like to go electric. This discussion may continue next month with the announcement of the QS winner. And hopefully some highlights of upcoming Oktober/Brew fests! What we would like to know is what do you want to for a monthly discussion topic? Malts, hops, water, mash chemistry, barleywines, whatever – just let me know! There has been a request for sours so that will be a topic once we have a good speaker lined up. First thoughts are Shawn from J&M but with the crush on they are swamped so it may be a meeting or two. We are looking into having the September meeting offsite and more updates to that will follow. 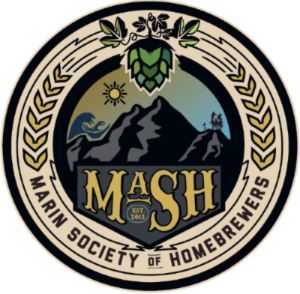 Just a reminder that the quarterly style is Hefeweizen/American Wheat, please dropoff entries at J&M on Sat 9/17 by 5PM or email me at marinmashers@gmail.com for an alternative plan. This will give the judges time to review everything before the meeting. If anyone else would like to judge please let me know, the more people tasting the better the feedback will be. In terms of club news and events there are a few updates. The next event the club will have members at is the Nor Cal Homebrew fest and we will be sponsoring a booth. Thanks to Jim, Mark and Kevin for representing! The theme is Belgian. Definitely still time to get a witbier done to bring with you! More importantly, and even if you don’t go to the fest MaSH T-Shirts available now!! There is a link on the main page and blog. Grab your MaSH T now in our campaign as there are roughly 5 days to go. We need to get 10 ordered for them to be made. Here is the link so you order them directly from here without having to go to the site. Finally there is an AHA rally at Heretic Brewing Co. on Oct. 29th. Information here. Please be sure to RSVP if you can go. Historically MaSH has gotten a bus to take us to the event and we will be doing it again this year. The club will pay for part of the bus and the more people that go the less cost to all of us. It’s a 14 person bus and there are still plenty of seats left. I have setup a page on the site for people to sign up for a seat. You do need to be an AHA member to attend the rally. The rallies are well worth it and so is the AHA membership if you aren’t already signed up. There is a wort giveaway again this year to the first 200 to RSVP so keep a vessel free for transport home. Last year they gave out yeast as well so it was essentially a free batch. Club RSVP here. Also, we can bring homebrew on the bus as well as lunch / snacks. Attendees were also gifted a sixer of evil twin on the way out, it was a great time.